cooooo? coo. coo coo coo. 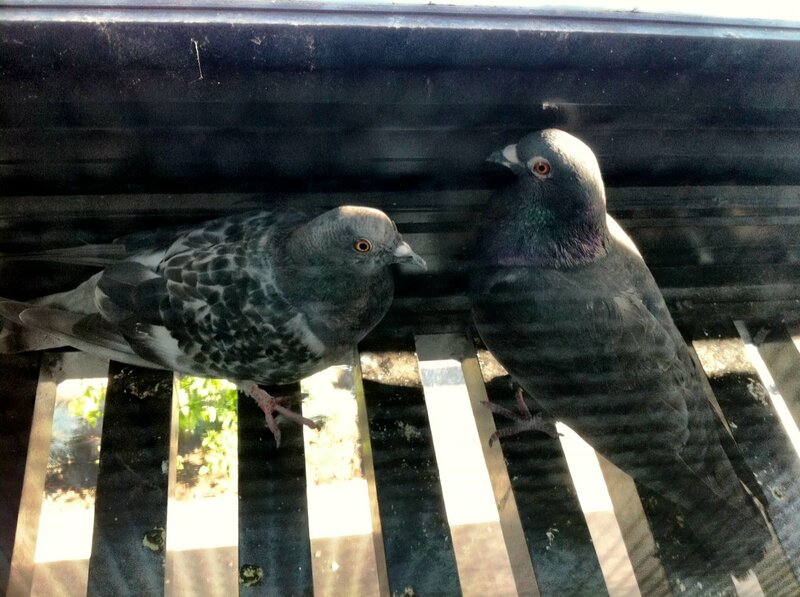 Our condo building has a problem with pigeons living in our parkade. They’d nested above the 2nd gate, and pooped everywhere. At one point I think there were several pigeon couples living in there; at least one nestful of babies had been laid, hatched, and grew up all underground. The gate was wide enough to allow the pigeons to hop through, so they added wire screens between the bars. This meant the birds couldn’t come and go at will, but that didn’t really faze them – they simply waited until cars came or went, and flew out to get food. Pigeons are creepy smart, and they managed to circumvent or just plain ignore every anti-pigeon measure that went up in our building. They’re the avian equivalent of the honey badger – they just do not care. I never had a problem with the pigeons. I talked to them when I passed, and in my head we had excellent conversations about seeds and feathers. Yes, the disturbing amounts of bird poop they left in our parkade was kind of gross, but they never pooped on me or Lola and we have a maintenance man equipped with a hose, so .. no biggie. The building people didn’t share my nonchalance though, and eventually installed bird spikes on every possible surface which drove the birds out once and for all. I kind of missed them, but I am not right in the head sometimes. Yes, the pigeons were driven out of our parkade .. only to relocate to a new, even better home: the Juliet balcony of Sparta. i eat them now, yes? When Ed came home, I showed him our new friends and we named them: Coco and Dirk. 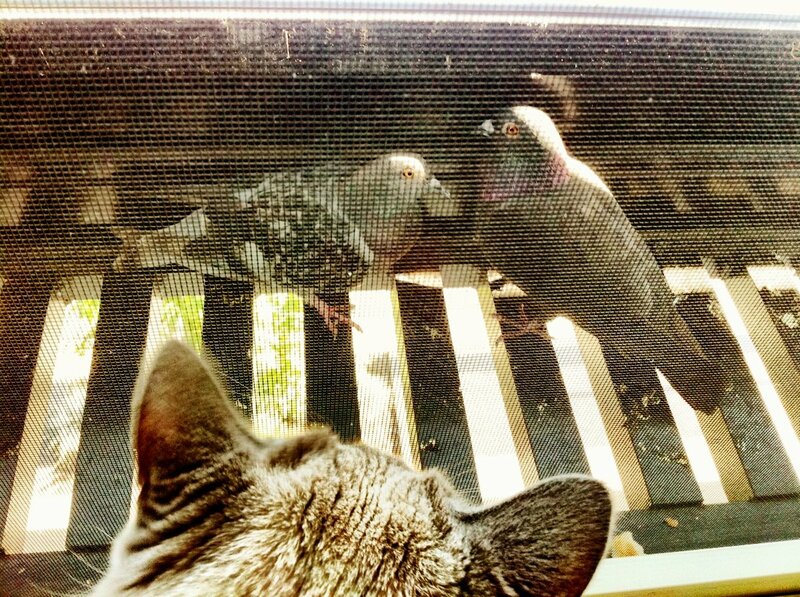 Ed isn’t too thrilled with our new additions, but I like the pigeons. We sat watching them for a long time, and Ed took some video. There’s a screen door on our balcony (as with all our windows), so I opened the sliding door to see if my new friends would bolt: they didn’t. All that separated their fat little bodies from the certain doom at the teeth of an inbred cat was 16 inches and a piece of mesh, but they were unconcerned about any of it. When the noise from traffic became too loud and obnoxious to bear, I closed the sliding door and went inside to restock my damn tower again, thinking the birds would likely fly away to greener pastures. That didn’t happen, even though I hung out with them several more times during the evening. Before I turned in for the night I checked once again, and the birds were fast asleep – fluffy feathers and heads under wings and all. They were also there when I woke up this morning; one still asleep and the other looking around for new, exciting places to poop. I don’t want to get too attached to the pigeons – Lucy and Hunky Pete will be the only bird couple for me – but I can’t help but squee a little bit at my new friends, dumb though they may be (I tried feeding them some bread, but they just looked at it and hopped away from me when I tried to get it closer to them). Will they still be there when I get home tonight? Who knows. Ed hopes not, but I kind of like them. They’re no pug, but .. y’know. Animals. I like ’em.